This Catalogue contains links to all past and present issues of TWC's publications. As such, it is a constant work in progress. Click the icon to access the list of issues for that publication. Last edited by Påsan; December 23, 2012 at 09:25 PM. Article: How do AARtists choose what to write about? Article: Where do stories come from? Article: Creative Writing - ‘All for one, and one for all‘! Tale of the Week: The Rebirth! AAR Review: Over the Top, Lads! AAR Review: Interactive UFO X-COM AAR/Let's Play! Article: Writing: What's the point? AAR Review: Julian, The Savior of Rome? SCRIPTORIUM WINTER WRITING COMPETITION: The Winners! AAR Review: Fry those Furballs! AAR of the Year Competition! AAR Review: A People, but a Nation? Mod Focus by Titus Atius Labienus, Punic: Total War. Mod Focus by dimitricus, Europa Barbarorum. Mod Focus by GaiusGizmo, The Hun Invasion. Mod focus by General_Sun, Fourth Age: Total War. Mod focus by Centurion Quintus, Age Of Hellas. Mod focus by teecee, SPQR. Mod focus by Garbarsardar, Roma Mod. Mod focus by Carousel, Troy : Total War. Mod focus by teecee, Darthmod. Mod Focus by Centurion Quintus, Native America : Total War. Mod Focus by Carousel, Imperii Romanvs. Mod Focus - Imperium Total War. Mod Focus - Pax Brittania. Mod Focus - Hegemonia Total War. Mod Focus - Byzantium Total War. Mod Focus - Jidai No Ran. Mod Focus - Europa Barbarorum. Mod Focus - Rise Of Persia. Mod Focus - Iberia: Total War. Mod Focus - Imperialism: Total War. Mod Focus - The Crescent and the Cross. Mod Focus - Extended Greek Mod. Mod Focus - Crusader Total War. Mod Focus - Zhanguo: Total War. Mod Focus - Ortus Romani. Interview: Lusted of Lands to Conquer. AAR: Into the West by Hex Khan. Interview: Re Berengario of Anno Domini. Interview: byzantineklibanophori of Medieval Total Realism: Age of Ambition. Interview: tnick777 of Wrath of the Norsemen. AAR: The Italian Duke by Hex Khan. AAR: The Italian Duke (Part 2) by Hex Khan. Interview: Repman, derdrakken, and Tokus*Maximus of Deus lo Vult. AAR: The Sons of Alexander by Hex Khan. Interview: dvk901 of Roma Surrectum. AAR: The Bear-Russian by Ippius. Interview: deRougemont of Character Names Project. AAR: The Rus Chronicles by Bulgaroctonus. Interview: Kagemusha of Ran no Jidai. AAR: The Rising Star by Hex Khan. Interview: Agronak gro-Malog of Age of Darkness. AAR: The Rus Chronicles (Part 2) by Bulgaroctonus. Medieval II: Total War Strategy Guide. AAR: Sons of Drest by Bulgaroctonus. Interview: mirage41 and AlphaDelta of Broken Crescent. Interview: oscarreeve of Narnia Total War. AAR: Sons of Drest (Part 2) by Bulgaroctonus. Interview: Zephrelial of Clouds Across Europe. AAR: Sons of Drest (Part 3) by Bulgaroctonus. Interview: bubka and tommo_312 of the Rookies' Nook. (*]Medieval 2: Total War – How to get the most from your graphics card. AAR: Sons of Drest (Conclusion) by Bulgaroctonus. Interview: Rammstein of Road to Jerusalem. Interview: justme and DrIstvaan of Renaissance Total War. Interview: Luciano B of Paeninsula Italica. AAR: Para Dios y el Rey by Bulgaroctonus. Interview: Re Berengario I and alpaca of Anno Domini. Interview: -apocalypsis- of The Fourth Age: Total War. Interview: PXZyan and Ali_the_English of Brittania Mod. Interview: dragases1453 and selenius4tsd of Aevum Fidei. Interview: finneys13 of Character Names Project. Interview: Cegorach of Pike&Musket Mod. Chronicle of the Nightbreed by Halie Satanus. Interview: Raven Darkwing of Wrath of the Norsemen. Chronicle of the Nightbreed (Book 2) by Halie Satanus. AAR: Para Dios y el Rey (Part 2) by Bulgaroctonus. Interview: socal_infidel of Pro Deo et Rege. Interview: Halie Satanus and makanyane of End of Days II. AAR: Para Dios y el Rey (part 3) by Bulgaroctonus. Medieval II: Total War General Discussion. Rome: Total War General Discussion. An Interview with Ramon Gonzalez y Garcia. M2TW AI Mods Shootout: Darthmod vs Ultimate AI. Dominion of the Sword Interview. Picture of the Week Roundup. Interview with blaster fodder of The Frontier. An Online Battle with the Prince of Macedon. Makedon AAR: Rise of Persia Mod. Picture of the Week Roundup and News. Video of the Week Roundup. A Note from the Consilium Belli. Eagle Standard Banner Contest Information. The Taming of Mauretania: an AAR by the Fuzz. B. Ward's "Modder's Resources vol. 4". Total War Eras Forum Report. Empire: Total War Forum Report. Rome Total War Online Battle #1138. AAR Competition Roundup and News. The Battles of Jena and Auerstedt: A TW based Documentary. SeniorBatavianHorse: Author of History and Entertainment. XVIIth Century Mod: Dominium Maris Baltici. ETW Interview with CA developer Thamis. XVIIth Century Mod: Dominium Maris Baltici Mod news!. An interview with Hross: Dominion of the Sword. An interview with Nakharar: East of Rome. Interview with danova of The Last Kingdom. God Save the King and You Are the Senate. An Interview with Total War Multiplayer Player Yellow Melon. An Interview with AAR Writer Kallum. A Comment on Clan Community Shield. An Interview with Roman_Man#3 of Megas Alexandros. AAR - March of the XI Hispania: Prologue. After Action Reports & Community RPGs Forum Report. Spotlight on Das Heilige Romische Reich Mod for Medieval II Total War. The Art of the AAR. A New Dawn for GSTK. 20 Movies To Get You In The Mood For Empire:Total War. AAR - March of the XI Hispania: Chapter One. Empire: Total War Personal Review. An Interview With Multiplayer |Sith|7|Darth_Max. An Interview With Augustus Lucifer about "All Under Heaven". A Total War Mod Poll. Total War Eras: Forum Report. All Loud on the Modding Front. Tale of the Week Roundup and News. A Positive Medieval II Rant. The Future of Total War Multiplayer. An Interview With Redfox of Diadochi: Total War. An Interview with DARTH VADER of Darthmod Empire for Empire: Total War. The Great RPG Die Off. Editorial: I Never Liked Vanilla. AAR - March of the XI Hispania: Chapter 2. An Interview with Y2day of Road to Jerusalem. An Interview with FearofNC - Head of the FearfulWays Clan. Highlights of Third Age: Total War. An Interview With Players of Lands to Conquer. An Interview with Immortal of Canaan: Total War. An Interview with Theodotos I of The Frontier. God Save the King: Role-Playing meets Modding. An Interview With Subrosa Florens of Amazon: Total War. An Interview with Seleucos of Olympia of The Greek Wars (TGW). Can A Brotha Get a Purple Ocean... Please. Graphics Competition Roundup and News. An Interview with the Players of YATS. An Interview with Jarlaxe of Hegemonia (RTW). An Interview with Toon Total War (ETW). An Interview with the team of American Civil War (ETW). An Interview with wartotalworldguy of WWI (ETW). An Interview with SonOfOdin of The Knights of Malta (ETW). Medieval II and Kingdoms News. Total War: Medieval II News. Total War: Empire and Napoleonic News. Special Report: TWC Official NTW Teaser. Special Report: The Oblong Table. Roma Surrectum II Release Exclusive Preview. Latest Empire and Napoleon Gaming and Modding News. Latest Medieval II and Kingdoms Gaming and Modding News. Latest Rome and ERAS Gaming and Modding News. Artists Gallery Featuring various Graphic and writing activities. Captains Cabin Featuring Exclusive interviews with famous modders. Latest MTWII & Kingdoms News. Latest Eras News (Lite Version). Captains Cabin - Modding Interviews. Latest Empire and Napoleon News. Exclusive Interview with Foot of EB II. An Interview with Competitive Player: Selifator. Interview with magpie & A Sneak Peak at RotN. The Story of Acrotatus of Sparta by Aster. A Report on GSTK: An Interview with the Players. Interview with Local Moderator Caesar Clivus. Details on that mysterious place somewhere 'East of Rome' and a man called Nakharhar. Africa Total War Preview and Interview With Lebre. Interview with Wild Bill Kelso of the TWC Spartan League Fitness Forum. Review of the 'The Kingdom' - A Stainless Steel AAR. The10thLegion sounds off on 'Why Mods Die'. 'A Proper Empire: Terra Incognita' & Interview with Alpaca. 'Star Wars: Galactic Wars' for ETW & Interview with P.A..
MII mod 'Ferrum Aeternum' & Interview with Tzar. A Different Taste in Mods - Featuring two unique RTW mods & Interviews with their leaders. Interview with former CdeC member 'Soulghast'. An Interview with apple of Roma Surrectum 2. Interview with Fight Club member kb8. Killer's Modification Previews - This Month - Wrath of the Norsemen. The10thLegion's Mod of the Month. Interview with Absithia from Vacuus Lux Lucis. A Graphic State of Affairs. Nazgul Killer's Modification Previews - This Month - All Under Heaven. Interview with Interactive History Player AggonyDucky. Mount&Blade - A PC Game Review. Interview with TheFirstOneill creator of Thera. Interview with IVIarkI2I Co-Leader of Patria Libera. Interview with .Org Interactive History Player Cultured Drizzt Fan. Interview with wudang_clown leader of Broken Crescent. An Interview with an Editor (Part1). Interview with ultimation on the Republic of Venice Community RPG. The Gods of Modding - Interview with MarcusCorneliusMarcellus. Baltic Total War Mod & Interview with the creator EarendilElenthol. Interview with an Editor - Augustus Lucifer. The Gods of Modding - Interview with alpaca. Interview with an Editor - Astaroth. And the next Total War game is? A Look at Mount&Blade and one of TWC's most Active Players. VLTIMVS ROMANORVM & Magister Militum Flavius Aetius. Four new Medieval II mods on the scene. Silver Spotlight on Rebel Jeb. Interview with Anthonius II on CBUR. Military journal of Nazgûl Killer. Interview with War of the West Mod Leader: St. Polycarpe. Total War Center Official Minecraft Servers. Role Playing Game: The Roman Struggle. Featured Review: The Elder Scrolls V: Skyrim. Interview with Kallocain from Paradox Interactive. Featured Review: Crusader Kings II. Note The Silver Shield is no longer in production. We would like to thank you all for reading and your support. State of the Thema Devia. State of the Thema Devia... Revisited. The Speaker on the Curia. Another State of the Thema Devia. State of the Political Debate. State of the Discussion & Debate. The 'Pit, the Academy, and the Ethos. Political 'Pit, Academy, and Ethos, Mores et Monastica. Political Academy & Ethos, Mores, et Monastica. Interview with Erich von Manstein. Universitas Ludus Olympus & The Arts. The Ethos, Mores, et Monastica. Green Grass on the Western Front: A Short Story. The Vestigia Vetustatis by rez. A Christmas Buyer's Guide of Technology. Politics – From the right! Rahl's Rants: African > Gangsta. Breed Profile: The Siberian Husky. Sir Donald Bradman, Greatest Cricketer Ever. Times are changing, but so what? Copenhagen – Hope for the future in more ways than one. Rahl's Rants: To Smoke, or Not to Smoke? Rep Wars - Episode II. Seven books you should read...but probably never will. The UKIP giveth, and the UKIP taketh away. Hot Wired - Computers, Homosexuality, War and Shakespeare. The Way of the Empty Hand. TWC History Lessons or, the Ramblings of Ancient Madmen. Rahl's Rants: What the Hell is He Ranting About? The Real Problem with American Education: Part I . Gay rights and private property. The Real Problem with American Education: Part II. Elzabar's Autobiography - The Musical. Advertising: The Billion Dollar Lie. The Late Roman and Early Byzantine Army. Rahl's Rants: Dinosaurs Aren't Real! A Review of the "Clash of Civilizations". Eichmann in Jerusalem, the banality of evil. The Downfall of Napoleon and the Congress of Vienna. Norman Mailer, “Superman Comes to the Supermarket”. The Internet and the Music Industry. Rahl's Rants: Movies & Beer! Limited knowledge for limited minds? Campos do Jordão, the Blossom and the Fondue. The Downfall of Napoleon and the Congress of Vienna Part 2. 'Friends' - A Technical Masterpiece. A Brief Background to Ireland and the Troubles. Rahl's Rants: An Unrant...Rant - Musings on God. Troubles facing the British Military. Rahl's Rants: Musings on God Part Deux. Globalisation and the new social order. Star Wars vs Star Trek or: How Much I Love Star Trek Part I. The Most important feature of Britain’s constitution is Parliamentary Sovereignty. The marvelous world of Itatiaia. Forgotten Battles of World War 2: Operation Husky. The Battle of Kursk Part 1. Star Wars vs Star Trek or: How Much I Love Star Trek Part II. Political Theories Part 1: Equality. Political Theories Pt.2: Liberty and Liberalism. Star Wars vs Star Trek or: How Much I Love Star Trek Part III. How important is the Media in shaping the election Outcome? Scottish Nationalism - a non-political commentary. World of Warcraft: Cataclysm, a review. Forgotten Battles of World War 2: Operation Avalanche. Political Theories Pt.3: A brief look at Conservatism. Star Wars vs Star Trek or: How Much I Love Star Trek Part IV. An Explaination of Kantian Ethics. How many times is Apple going to reinvent the wheel? The Battle of Kursk Part 2. Events that shaped Britain pt. 1: Ancient Megatsunami. How do Grey Whales Navigate? Early Macedonian Warlords – The predecessors to Philip & Alexander the Great. Games With a Sense of Humour. Star Wars vs Star Trek or: How Much I Love Star Trek Part V and A New Age: The Ease of Knowledge. Monarchies, and why they're still applicable. The Problem with Fish: Part 1. The Romance Languages: Ancient Italia. A Guide to Rock Operas: Part 1. Democracy Humbled - The Great Athenian Siege of Syracuse (415-413BC). Theodore Komnenos Dukas and the race for the conquest of Constantinople (1215-1230). How is authority bestowed upon governments? Democracy Humbled-The Great Athenian Siege of Syracuse 415BC-413BC Part 2. A Guide to Rock Operas: Part 2. Telling A Story And Presenting A Story. Antiochus III the Great - The 'Anabasis' in the Upper Satrapies. Democracy Humbled - The Great Athenian Siege of Syracuse 415BC-413BC Part 3. Introduction to: Ancient Greek Religion. January Forum Report: Mudpit, TWC University, & Garb's Fight Club. January Forum Report: Thema Devia. The Singularity - Is It Real? Last edited by Vaðarholmr; December 19, 2012 at 02:44 AM. Sadly this episode is unavailable. I apologize for the inconvenience this might cause. Guest Stars: Mithiras and Stradar. Introducing a new co-host: Leonidas the Lion. Doing it the "Greek" way! The Great War interview with Aanker. Shogun 2: Rise of the Samurai DLC. Games : Raging over Rage, Ocs Must Die, Skyrim, BF3, Saint Rows. History : shields in ancient Japan. 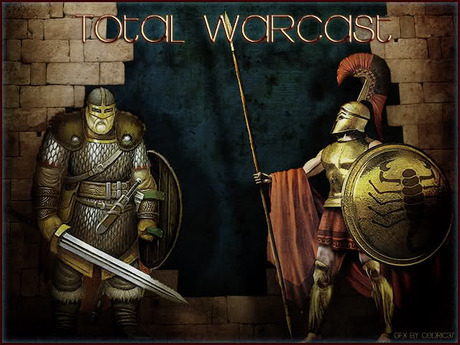 I am back with another installment of the Total Warcast. Enjoy. Le Vengur and Dekutrash joins me in a adventurous episode 15. I wrote Boustrophedon's name wrong in the video. Don't shoot me. Rep him for this nice effort! Announce CA joining in on the Total Warcast after Rezzed and how I want people to send questions to me so I can directly ask CA. Finally we have gotten around to gathering our bodies in front of the ye old computer and done the Interview with Creative Assembly. Jack Lusted was nice enough to sacrifice his Sunday evening to let me, Gunny and Leonidas the Lion to batter him with questions. Many of the questions sent had to be cut. Not only based on the nature of the questions but also to minimize the time we spent talking. And on the question; Coffee or tea when we were not recording? Jack answered surprisingly neither. Gunny, Mitch and Aanker is joining me this week for a special Mod corner. The Great War and some game politics discussion is on the agenda. Register and write your minecraft name in the thread. Daniu joins us for a glorious Warcast where we ask him about the modding summit with more. Finally we are bringing you yet another episode of Total Warcast. Me and Gunny tear trough this issue where we talk about the recent releases from Content staff. We also duke it out in the forum frenzy and finally disagree upon something. We end the Warcast talking about upcoming releases in November. Pretty much the biggest titles. Enjoy. New TWC Minecraft PVP server video and it is glorious. Dishonored sold well. Franchise born. Huzzah! This week it is time for a special Warcast and that is a interview with the modder, DARTH VADER. He tells us about the early days of his modding career, the community back then and some personal announcements regarding the future. A must listen for anyone interested in the Darthmods. This week Steph from Masters of Europe joins us for nice talks about him, modding, his mod and much more. AoEII HD is out on Steam: 9 April 2013. Join me, Funny and Guzz while we tear apart the new factions for Rome II and also talk loosely about some new releases and personal stuff. Enjoy. Me and Fuzz invites GED on for the celebration of the 10th year anniversary of TWC. Volound and CosmicContrarion meets with Daily for some chatter about who they are and what they do. UndyingNephalim joins me for some friendly banter about Hyrule Total War.